Sometimes you just see a challenge and take it. That’s what I did with the Wigan Half Marathon. After that, I kind of fell back on my running and lost all motivation, so signing up for the Whitley 10k 5 days before the start without having run properly for a month… Well that brought another challenge. 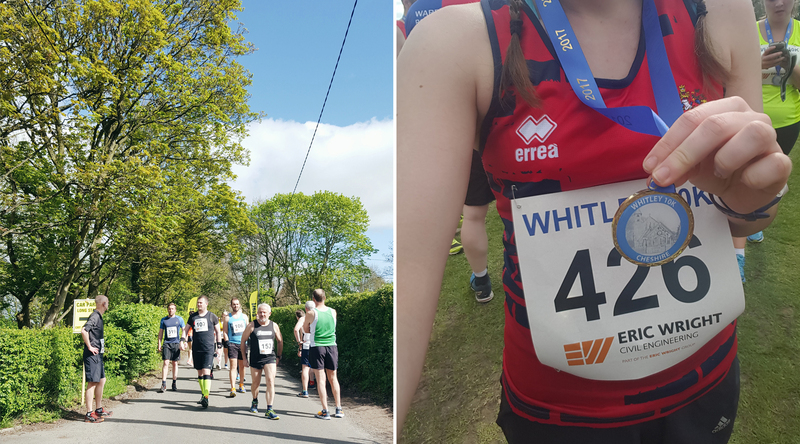 I’d never driven to Whitley before, in fact I’d never even heard of the place until I discovered this 10k race, but it was actually a lot easier than expected. I used my satnav of course, but the race was sign posted from a few miles out so that was helpful. I’d seen in the instructions that we had to drive in through a different road to what the satnav may direct and this was easily found. The parking was also great too, and well directed by marshalls. We were really lucky over the weekend in that we got a couple more days of sunshine so arriving at such a pretty little village in the sunshine was lovely. Having not run for the past month, I did find the first couple of miles a little tough. It just felt like I took a little time to really settle in, but once I had it was all fine. Just before the halfway mark I settled into a good pace, and I was running alongside another women. We didn’t speak, but I felt like we were pacing each other. She may not have felt the same way, but hey, it sure helped me haha. I felt a little bad when I pulled away at around 5km, but I was feeling really good by that point and I’d been warned about a bit of a hill around the 6-7km mark and wanted to get a little speed in before possibly having to slow down for the climb. This sounds really arrogant as I write it, but the hill was actually no problem at all for me. 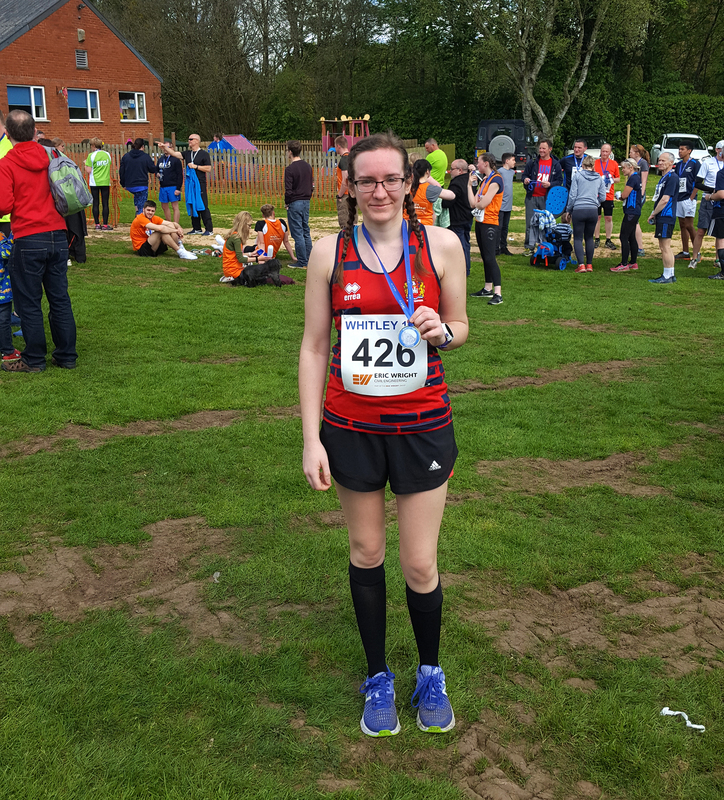 I mean, it wasn’t great – I’m not a big fan of hills – but after the monstrous ones at the Wigan Half and the Blackburn 10k it was nothing really. Never did I think I’d say that! I dropped pace a little bit but I still managed to stay under 6:30 for that split so I was pleased enough with that. From then onwards it was go, go, go! Do You Constantly Look At Your Garmin? Some people hate wearing watches and timing themselves when running. I am not one of those people. That said, I’ve learnt to just run and not constantly watch-check to see how I’m doing. Especially on Parkruns, I’ve just been running to how I feel. Sometimes it’s disappointing, like when I feel like I’ve been really pushing hard and then I don’t get a faster time, but honestly it’s made me enjoy the running so much more. Anyway, back onto the Whitley 10k… I checked my watch at 5km and I was just over 30 minutes. Not slow, but it meant I’d have to run the second half faster if I wanted that sub-60. I took on that challenge. After looking again around the 7-8km I realised I could do it if I just managed to keep under the 6min/km mark. I find looking at a watch constantly makes the run harder, because you’re aware of every little step, but I think if I hadn’t looked I might have just let my pace drop a little. With 1km to go, I didn’t have many people around me. I’d been picking off people as I ran, pushing myself that little bit faster each time. There was one lad, a few years younger than me I’m guessing and when I pulled up alongside him he definitely sped up a little. I managed to stay with him for a couple of minutes and then he pulled away and was into the distance! It pushed me though, and I knew I was super close to the end by now. Which brings me to the finish line. We headed back up a country lane and into the main area where everyone was waiting at the little community hall. The finish line was in sight, but oh, we had to run all the way around the parked cars first to get to that line?! This was pretty devastating, not going to lie haha. I’d just done almost 6 miles and this last 100 metres seemed SO far. But I pushed and pushed, and as I crossed the line the timer said 01:00:29. I knew my chip timing would be a little off from that, but I just didn’t know how much, and I only remembered to stop my Garmin after I’d had my chip taken off my shoe so that was out too. It was a long few hours waiting for that result! 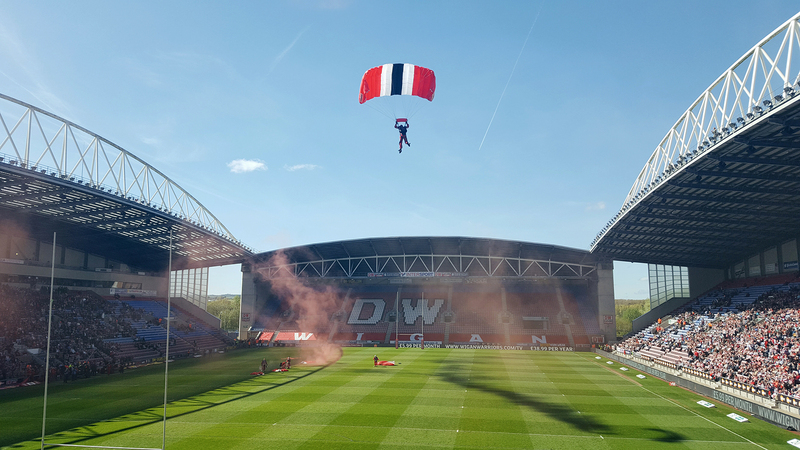 I spent the next few hours watching the rugby (and seeing this amazing stadium entrance by the Red Devils Parachute Team!) and constantly checking my phone. Must have been around 4pm when I spotted the results online and did a little dance in the female toilets when I saw 00:59:53!! New PB and finally under the sub-60 10km. So, so pleased with myself. Winning the rugby match too was just a great end to a great day. You can see the full overview of my run stats on Strava here! My next race is the Great Manchester Run 10k… sub-59 maybe?